Skulls have become a hot fashion trend and more than just Halloween art. 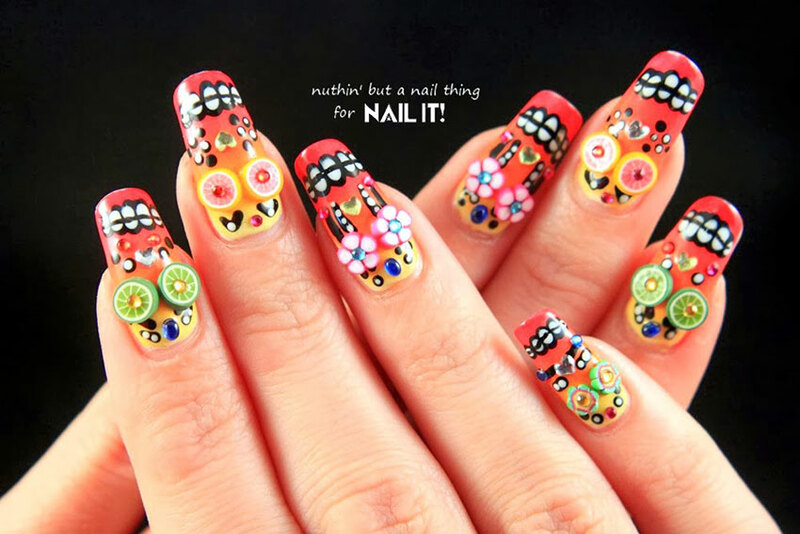 Whether it is a pirate skull and crossbones or painted sugar skulls symbolic of Dia de los Muertos, skull nail art can be as simple or as dramatic as your imagination allows. Using a quick drying manicure spray between polish colors on any nail design will save a great deal of time. 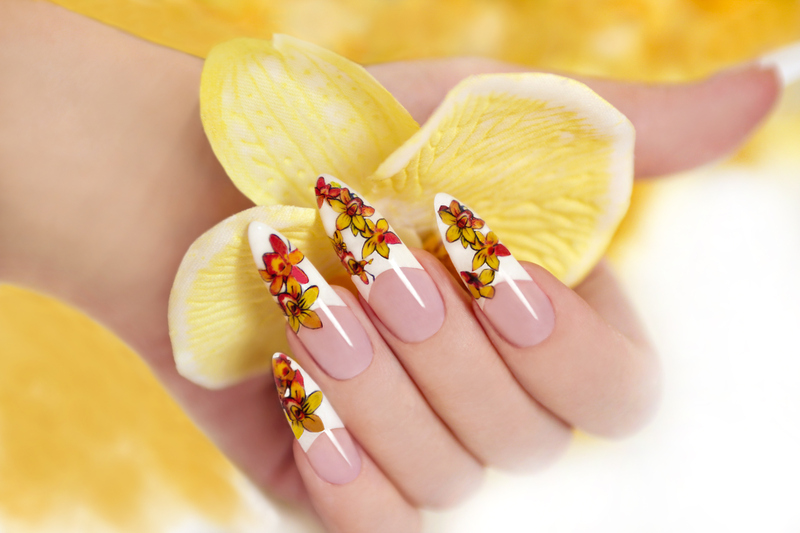 Dramatic 3D nail art designs such as this one will not last as long as all polish designs. They are, however, perfect for a party. To get the look shown here, start with oval shaped nails and follow these simple steps for each nail. After applying a clear base coat, apply a white polish for the base color. Using an airbrush or a damp makeup sponge, add yellow, orange, and red polish for a gradient base color for the skulls. Apply a clear top coat for a smooth surface for the details. Using a large dotting tool or nail art pen with black polish, add the eyebrows, mouth and cheek detail. Using a slightly smaller dotting tool or small detail brush, add the white polish details to the eyebrows and cheeks. Paint the teeth in white polish as well. Using a small detail brush or nail art pen with black polish, paint the separation lines between the teeth. The eyes of these skulls are made of Fimo clay canes. These are sold pre-cut or as canes to cut as you need them. If you have the canes, cut a thin slice and follow product instructions for baking them. Using nail glue, attach the eyes to the nails. Add the jewel embellishments with nail glue. Choose small oval, round and heart rhinestones for nail art that will fit the design. This design is anything but plain on short, rounded nails. 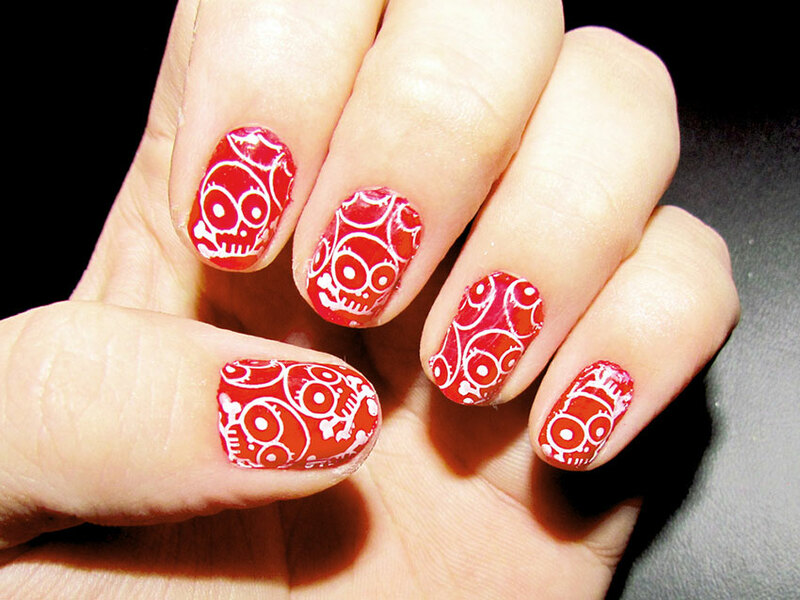 The red polish base color makes this skull design pop. After applying a clear base coat, apply two coats of red nail polish. Using a fine detail brush or nail art pen with white polish, paint the skulls in various areas on the nails making sure that some are partial skulls. Featuring bright colors, this is a simple yet artistic skull design. While this design can be done on any nail, the look here is done on long squoval nails (squared with rounded corners). Start by painting every nail a different color, such as blue, orange, green, yellow and red. The skulls are simply a freehand painted circle and a rectangle in white polish or nail art paint made with a small detail brush. Using a fine detail brush with black polish or a nail art pen with black nail art paint, outline the full circle of the head and the borders of the teeth. Add the eyes and nostrils in black as well. Sugar skulls are a typical design for Dia de los Muertos, and come in an endless variation of colors and designs. For this look, start with short squoval nails and follow these simple steps. After a clear base coat, apply two coats of a white creme nail polish. Using a fine or small detail brush, paint the lunula area (the half moon shaped area at the cuticle) in either a colored outline or fully colored half moon. Add dots of the same color polish along the edge of the half moon using a small dotting tool. 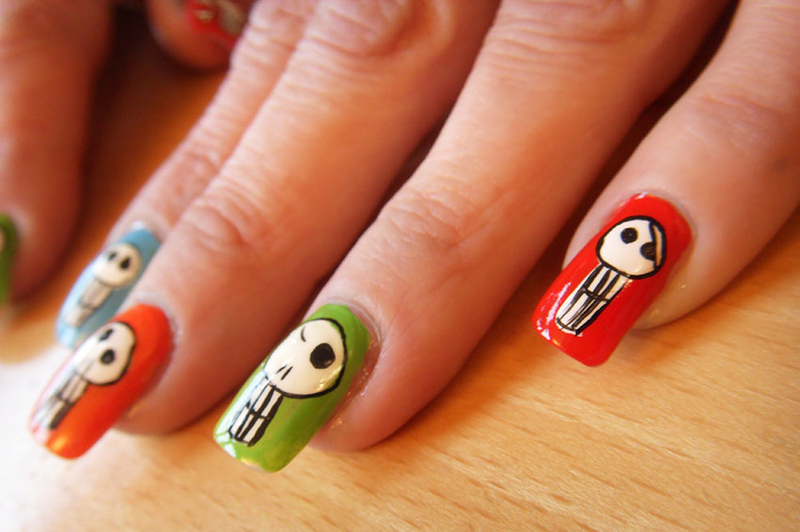 Using the same color as the top of the skull, paint small hearts for the cheeks at the middle of the nail on each side. Between the top of the skull and the cheeks, paint the eyes to resemble flowers using a dotting tool and a complementary color to the top and cheeks. Use a fine detail brush or nail art pen with black polish to paint an upside-down heart for the nose and ovals for the teeth. Carefully paint a line across the teeth to divide the ovals evenly in half. Add the pupil detail with a small rhinestone or contrasting polish using a small dotting tool. 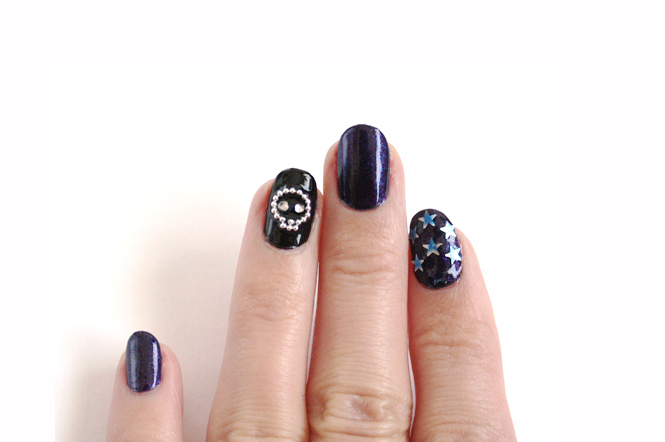 Black polish lends a dramatic background for metallic or rhinestone skulls. These can be found as stickers or decals. They are easily made with several small nail art beads and nail glue. Start this design on shorter oval nails with a rich black polish. Using nail glue, carefully place several small beads in a circle with three beads under the circle for the teeth. Add two small clear rhinestones for the eyes with nail glue. For more sparkle, add small stars to another nail on the same hand. Finish all nails with a clear top coat for the longevity of the design. A growing trend in do-it-yourself manicures is full nail decals. These decals are typically made of thin vinyl with adhesive on one side that will adhere to the natural nail and wear for a week or two - some brands last longer. They cover the entire nail and are smoothed out with or without heat depending on the brand. Using a nail file with downward strokes will cut and seal the edges. Finish with a clear top coat for a quick and elaborate nail design. For those who do not have such a steady hand to paint designs on nails, stencils are a wonderful help. Stencils can be used with either nail art paint and a sponge or with an airbrush. To achieve this look, start with nails squared just at the fingertips and follow these steps. Apply two coats of yellow polish over a clear base coat. Place the stencil over dry yellow polish. If using a sponge, lightly dab the sponge in orange nail art paint. With a gentle dabbing motion, apply the orange paint to the nail over the stencil. If using an airbrush, lightly spray orange paint over the stencil. Allow the skull design to dry and then use the edge of the stencil to make the straight line along the nail tip in the same manner as in step three. 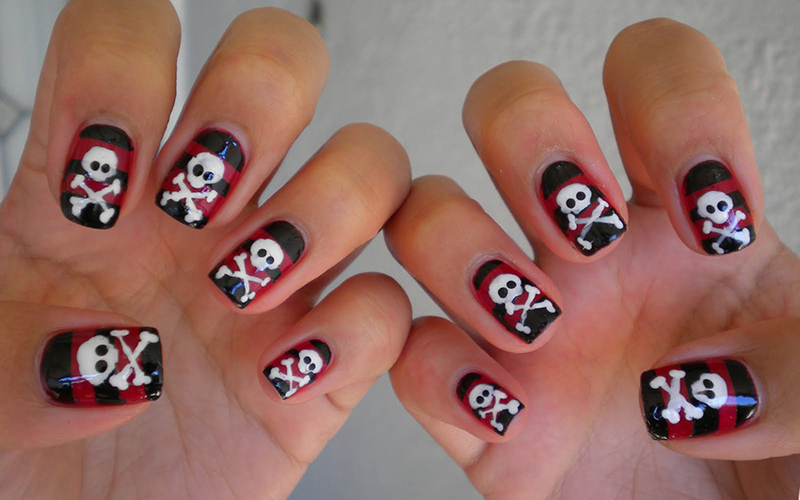 Want your nails to look like a pirate flag? Start this dramatic look on long square nails and follow these simple steps for the detail. After a clear base coat, apply two coats of a deep red creme polish. Using a detail brush and black nail polish or nail art paint, make three stripes on each nail. 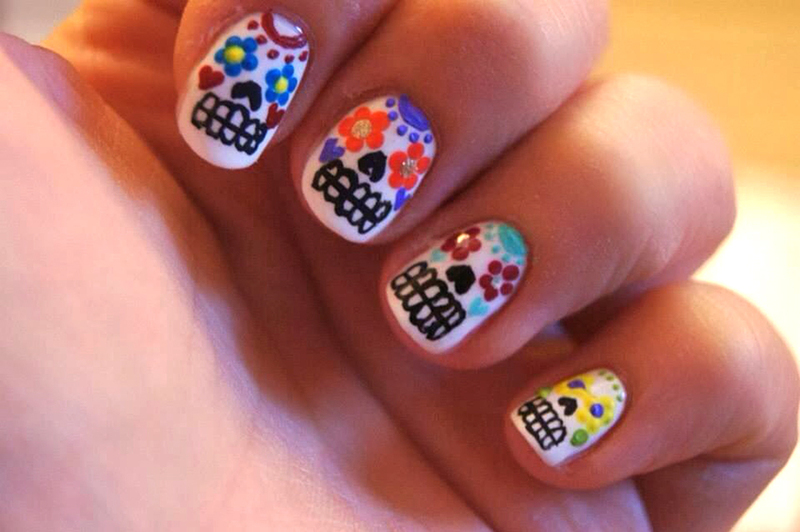 Use white nail polish or nail art paint and a small detail brush to make a rounded, peanut-like shape for the skull. Next, just under the skull, paint an X for the bones. Use a large dotting tool with white paint or polish to make the ends of the bones by placing two dots at the end of each line. Using the dotting tool and black paint, make the two dots for the eye sockets. These stickers are typical Day of the Dead skulls. While stickers can be used on any color of nail polish, the look here shows the stickers placed over a sheer pink polish for a natural look. 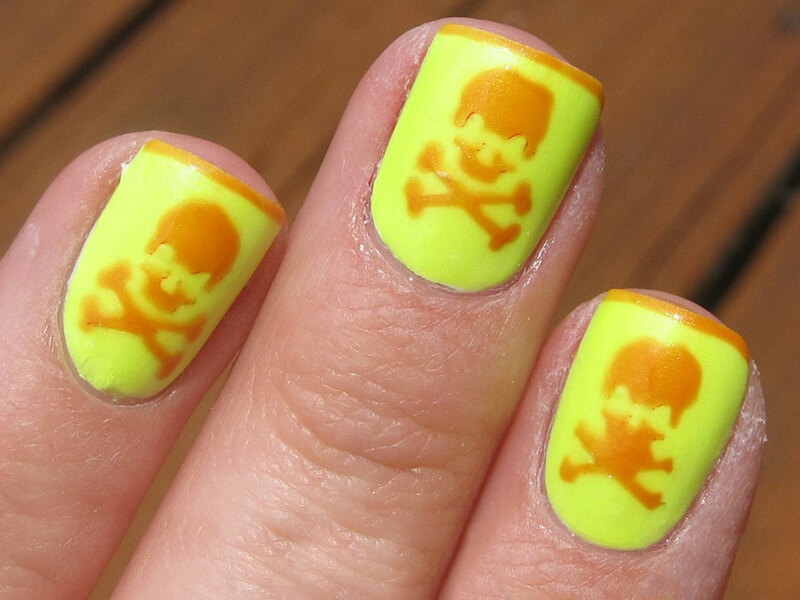 The rounded shape of the nails complements the skull shaped stickers. As with any nail design, finish with a clear top coat to ensure the longevity of the design. 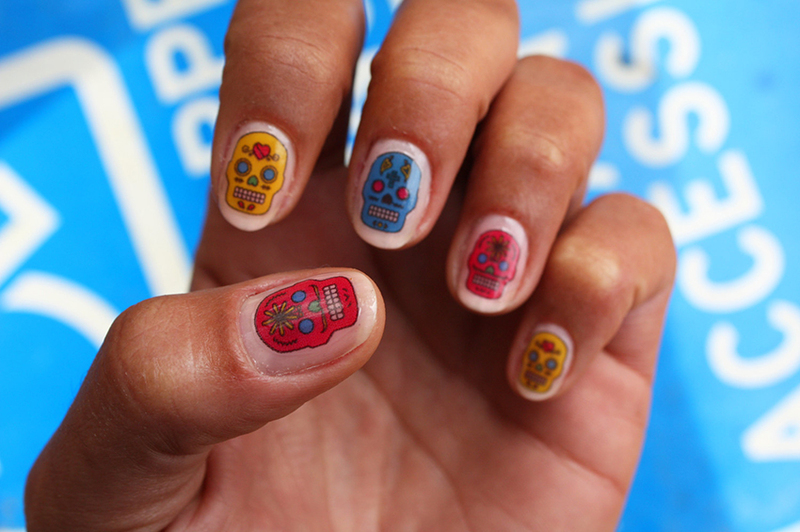 Skull-inspired nail art is great for occasions such as Halloween or Day of the Dead, but it's also a fun everyday look for those who like to accessorize with skull images. Get playful with your designs to create some original nail art looks.